I am pleased to tell everyone that file transfer receiving now works with Bonjour messaging! Hello everyone, this is Erich Kreutzer, another SoCoder. My project focuses on updating Bonjour messaging support within Adium. As some of you may have experienced, the current implementation has, unfortunately, not been kept up to date and thus does not work well (if at all). The current implementation also lacks support for file transfer. 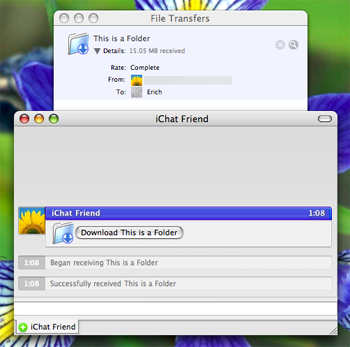 Thus, the primary purpose of this project is to get Bonjour messaging and file transfer working with iChat as well as other clients. At this time, the messaging aspect of the project nears completion. A few minor bugs still exist including buddy icons not being sent (although they are received). However, I found out recently that a few adventurous users have already started using the updated implementation! After I complete the messaging implementation, I plan to start implementing file transfer. I look forward to what should be a fun challenge. As the project progresses I plan to keep everyone updated! As discussed previously, Adium is participating in this year’s Google Summer of Code. Features Andreas wants to implement: Gateway support, PEP, user tune, user avatar, user nickname, OTR-over-Jabber improvements, , discovery browsing, ad-hoc commands, and possibly invisibility. On Jabber: Yes, we had a similar project last year, but that was using Smack (a separate Jabber library), which we had to drop because of the Java-Cocoa bridge going away. Andreas is back to do it again in libpurple. Also, we’re not going to have a separate student blog this year. Students’ blog posts will be here, on the main blog.